Once again we actually ended up doing our Time For Tot's day on Wednesday; it makes for a lot busier day but really is about the only semi-free day we have this week. 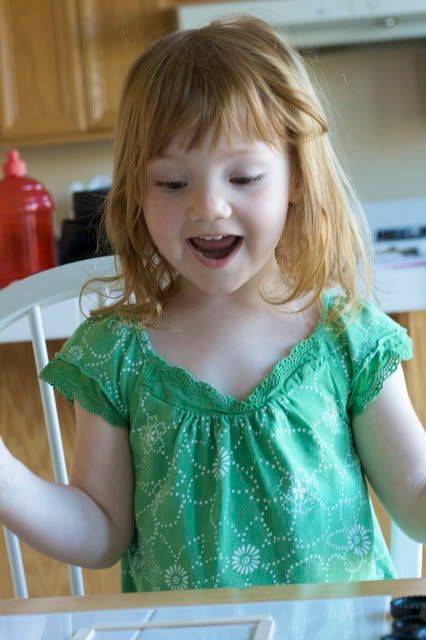 Last week when Alex called a rectangle a square, I realized that I don't know if I have ever spent anytime teaching her shapes. With the first child you are so diligent about teaching them things and with the second.. well a lot of it happens more naturally or just doesn't happen much at all; yet somehow they still learn. 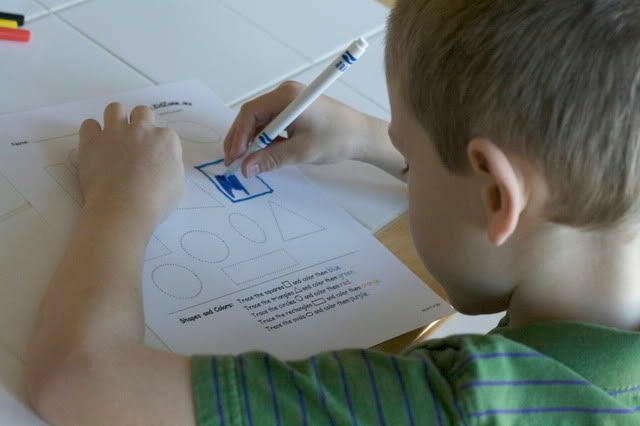 We began by watching a story about shapes and then an activity online where you find the shapes hidden in the picture. Both of these are pretty cute, but a little corny and loaded very slowly. Then we started tracing some shapes. The instructions at the bottom of the page use words and the actual shape to let you know what color to trace and color in the shape and Lucas totally picked up on this and read all of the instructions himself and did this page on his own. And Alex, it turns out she does know the difference between squares and rectangles. 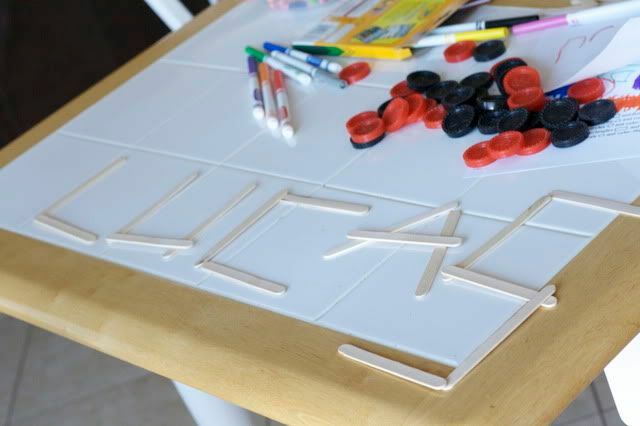 I gave the kids each 3 Popsicle sticks and asked what shape they could build with just three..
Lucas got it right away, and then we added more stick and made squares, pentagons and octagons. Then since it is St. Patrick's Day, we did one more activity with shapes and a St. Patrick's Day hat..
Lucas didn't want to do this activity and instead was doing this. 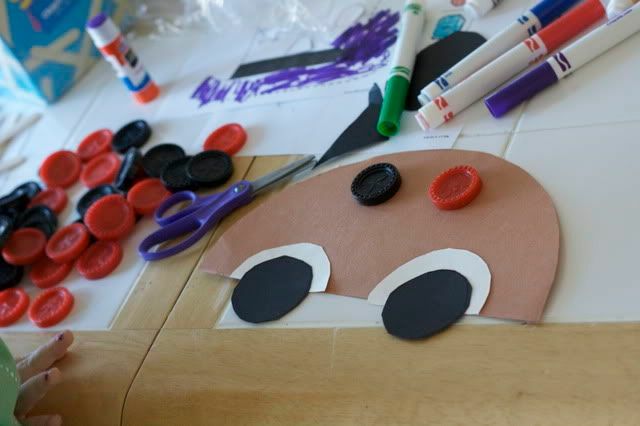 And we ended the day by making a car by just using circles and half circles.. I forgot to look at the template again so they didn't turn out exactly right, but the kids liked them. I had planned on getting out the play dough and letting them use shape cookie cutters to cut out different shapes; but after all of the other activities we called it a day. Wow! Go Lucas go! He's gonna rock at school. You have done (and are doing) great! The kids really do learn from their siblings...good and bad. haha. 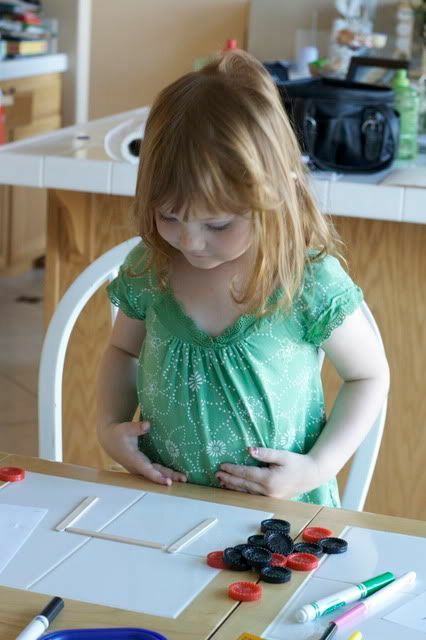 I love the popsicle stick game! We're going to try that. I love all the activities you're always posting! 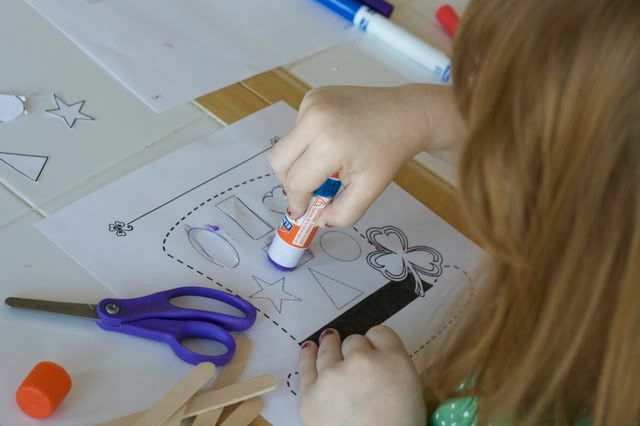 Where do you find time to be so consistent and always so creative with these projects for kids? And HOW do you find time to blog almost every day? :) I am just amazed! As always, you have such good ideas. I love how well everything turned out. 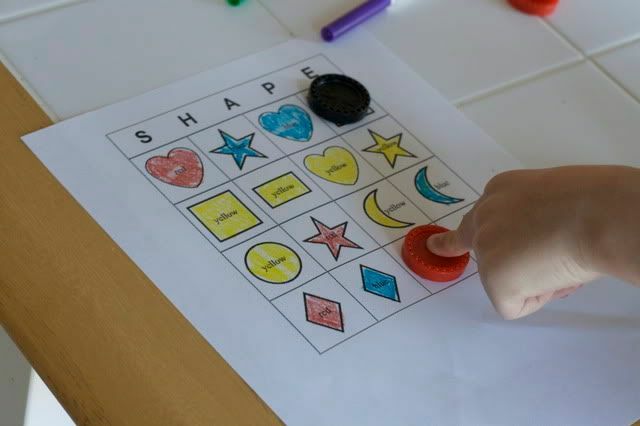 Shape bingo...that's fantastic! Love your resources.